Can You Trust Your Car Repair Shop? Sitting in the customer lounge waiting to hear the potentially expensive news about your car can be nerve-wracking. That’s probably because you feel like you’re at the mercy of the mechanic. But a car repair doesn’t have to be such an unpleasant ordeal. Armed with a little knowledge, including repair-shop options, negotiating tactics, and tips from Consumer Reports’ experts and industry insiders, you can feel more confident the next time you look at an estimate. We surveyed more than 40,000 CR members about their recent car repair experiences to come up with our best advice for finding deals and satisfaction for work not covered by a warranty. The assumption is that if it’s under warranty, customers should go to the dealer for repairs. We found that consumers who go to independent mechanics have a more satisfying experience and are more successful at negotiating a discount than those who go to car repair chains or dealerships. Our survey also indicates that haggling works more often than not when it comes to getting a discount at any type of shop. At the same time, CR experts and others recommend building a connection with a mechanic over time instead of casting around for the cheapest price for each repair. There are some easy ways to cut costs, but our survey shows that many consumers fail to take advantage of them. For example, few tried to negotiate a lower price for repairs that weren’t covered by a warranty. Only 21 percent made an effort to haggle, but when they did, 2 out of 3 reported they saved money. The haggling success rate at independent shops was higher—76 percent—when compared with other types of repair shops. Success at retail chains was almost as good, at 70 percent. Dealers were the least willing to give a discount, but even then, the success rate for hagglers was 61 percent. The median amount saved by customers who negotiated was more than $100, not just a few nickels and dimes, according to our survey. When looking at brands, customers who successfully negotiated the cost of their car repair at BMW, Mercedes-Benz, and Lexus dealerships saved the most in terms of total dollars: $198, $171, and $148, respectively. That may be due to the higher cost of repairing luxury vehicles. Compare pricing. Ask the mechanic what parts will be used. Those from the original equipment manufacturer (OEM) can be the most expensive, but you can save money by using OEM-equivalent parts. Make sure you understand the warranty terms for the part, whether it’s from the manufacturer or the repair shop. If a repair will cost almost as much as your car is worth—such as a transmission replacement—and you’re willing to do a little research, you can often save big money by looking for used parts at a salvage yard. But check with the mechanic first to see whether he or she is willing to use them. Fix it right the first time. “My best advice for consumers looking to save money on car repairs is to have your vehicle repaired right the first time by a qualified technician,” says Jill Trotta, vice president of industry advocacy and sales at RepairPal, a website and CR partner that helps people find fair repair prices. She suggests spending more on quality parts to prevent having to make the same repair again later. Shop around before repairs. “Most of us do research before making a major purchase. 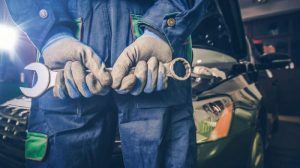 Car owners need to do the same thing,” says Trish Serratore, senior vice president of communications at the National Institute for Automotive Service Excellence, a nonprofit that’s dedicated to improving the quality of automotive service. Use online tools. Websites such as RepairPal and CR’s Car Repair Estimator can help you figure out what most repairs should cost. Plug in your vehicle’s year, make and model, and your ZIP code, and the estimator will return a price range and a list of certified shops that will honor that estimate. Certified shops are required to offer at least a 12-month/12,000-mile repair warranty. Follow your owner’s manual. As the saying goes, “If you take care of your car, your car will take care of you.” Many of today’s vehicles can last more than 200,000 miles with few problems if owners keep up with the required maintenance. Editor’s Note: This article also appeared in the February 2019 issue of Consumer Reports magazine. 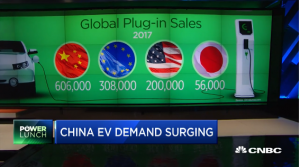 CNBC’s Phil LeBeau reports electric vehicle sales is surging in China, well above USA and rest of the world. About 600K EVs sold in China last year and expected to surpass 1Million by 2020. There are 26 EV companies in China ready to compete with Tesla. Tesla sold 14,000 cars in China and planning to build a plant there as well. GM sold about 11,000 under its Baojun brand. According to data collected from car manufacturers’ associations and other industry groups, plug-in electric vehicles accounted for no more than 2.3 percent in any of the world’s five largest passenger car markets in 2017. 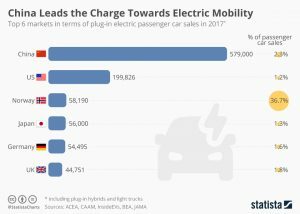 While China is by far the largest market for electric passenger cars, no country comes even close to Norway in terms of market share of plug-in electric vehicles. In 2017, more than one in three cars sold in Norway was battery-driven – a share that seems unthinkable in most other markets at the moment. Norway’s lead on electric cars has been driven by the government backing them with a wide range of generous incentives and perks, as a way of meeting its climate change ambitions. Buyers do not pay import tax and VAT on plug-in cars, shaving thousands of pounds off the upfront cost. Running costs are lower because electricity is cheaper than petrol and diesel, while road tax is reduced – and will drop to zero next year. Electric car owners do not pay the mosaic of road tolls, ferry fees and city emissions charges that other Norwegians face. Moreover, they can park for free and bypass traffic by driving in some bus lanes. It is my great pleasure and honor to appoint Prof Dhar to Telenyze Advisory Board. Our POC product has gone through many successful validation trials on hundreds of cars of various brands. Currently we use a small number of data sets and simple data analytics and Machine Learning models to detect and predict faults. We learnt a lot from these trials. Mostly the user behavior, the target market and what would be the appropriate business model. We are working on improving the UX/UI. At the same time we also want to enhance our data analytics and machine learning models to learn more from more data sets to derive more insights for our B2B customers. Prof Dhar is an expert in Statistics, Data Models and how to derive business value from data. His current focus is application of data models for Smart City and IOT applications. His expertise and industry presence will be highly valuable to the growth of Telenyze. 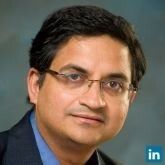 Please join me in welcoming Prof Dhar to Telenyze Advisory Board. Thanks. Please check the following link to attend his upcoming data science boot camp on Dec 1-2 at Plug and Play, Sunnyvale. Subhankar Dhar is a Professor in the School of Information Systems and Technology at San José State University. He is also an affiliate faculty member of the Center for Smart Technology, Computing, and Complex Systems (STCCS) and Silicon Valley Center for Entrepreneurship. His research interests are data science, big data analytics, mobile and cloud computing as well as wireless networks and has over fifty scholarly publications to his credit. In addition, he is also working on projects related to smart cities. He teaches a variety of courses including computer networks, distributed systems and web based computing. He serves as a member of the editorial board of International Journal of Business Data Communications and Networking. Subhankar is an invited speaker at national and international conferences and workshops. He also served as a member of the organizing committee of various international conferences including IEEE Advanced Networks and Telecommunication Systems (ANTS), IEEE Smart World Congress, Workshop on Large Scale Complex Network Analysis among others. Recently, he also served as a co-chair of International Summit on Smart World and Smart Cities. Subhankar has several years of industrial experience in software development, consulting for Fortune 500 and high-tech industries including product planning, design, and information systems management. Subhankar received his Ph.D. in Mathematics from the University of South Florida, Tampa and is currently a member of IEEE. How Far Along Is Self-Driving Car Technology, Really? Google’s cute and futuristic self-driving “panda cars” made a strong impression on the public back in 2014. But the first true self-driving vehicles to come to market will look much more like today’s vehicles. In articles about self-driving technology, you often will see references to “Level 4” or “Level 5” systems. Those levels refer to vehicle-automation standards set by SAE International — the professional association of automotive engineers — and are widely accepted around the world. • Level 2 is an advanced driver-assist system, one that can control both steering and braking under certain circumstances, but isn’t considered self-driving. • Level 3 is a system that can actually drive the car, but only under limited circumstances. Level 3 systems require an alert human driver who can take over on short notice. • Level 4 is “high automation.” In practice, that has come to mean a system that can do most of what a human driver can do, but only in a limited (well-mapped) geographic area. • Level 5 is full-blown autonomous driving: The car can go anywhere and do anything an experienced human driver could. There’s one more critical fact to know: The levels are set by the manufacturer of the systems — there’s no third-party authority evaluating them — at least not yet. General Motors‘ (NYSE: GM) new Super Cruise highway system and Tesla’s (NASDAQ: TSLA) current Autopilot are borderline Level 3 systems. Both drive the vehicles under limited circumstances, but require a human driver to be ready to take control. But both GM and Tesla have shied away from applying the Level 3 label to their systems, because Level 3 is controversial: It’s the first level that implies the car can actually drive itself. And the systems raise a big question: How quickly can a distracted human turn to take control of the vehicle in what might be a sudden emergency? The questions have led some companies, including Ford Motor Company (NYSE: F), to say that they will skip Level 3 and work toward Level 4 instead. But others are pressing on. Audi will soon introduce a highway-driving system on its 2019 A8 sedan that it’s calling a Level 3 system. Is it more advanced than Autopilot or Super Cruise? It’s hard to say yes: Frankly, on paper, it sounds similar to Super Cruise. But Audi gets to call it Level 3 if it meets the standard. 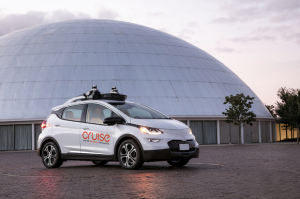 A white Chevrolet Bolt EV with visible self-driving sensor hardware is parked outside GM’s historic Design Dome in Warren, Michigan. A self-driving version of GM’s Chevrolet Bolt EV could be the first Level 4 vehicle to enter mass production. Image source: General Motors. Level 4: Coming soon, but to which market? Several companies (and groups of companies) have Level 4 systems under development, and at least a few are expected to become available in some way by 2020. Notably, a partnership that includes Intel and giant auto-industry supplier Delphi Automotive have promised to have a Level 4 system available to automakers by the end of 2019. Cars using that system could start appearing on the roads a year or two later. Some could appear sooner. GM’s first Level 4 car is nearly ready for production, but GM isn’t planning to sell it to consumers. Instead, it’ll go into service with ride-hailing companies like Lyft. You may be able to ride in a Level 4 car a few years before you can buy one. 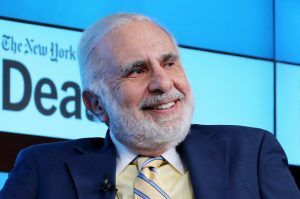 Other first-to-market possibilities include Tesla, which could offer a Level 4 system before the end of the decade, and Daimler AG (NASDAQOTH: DDAIF), maker of Mercedes-Benz vehicles and heavy trucks. But it’s likely that most buyers won’t be able to buy a Level 4 vehicle until 2021 or 2022 when the systems begin appearing as options on cars, trucks, and SUVs aimed at consumers. Two Mercedes-Benz tractor-trailer trucks on a highway. The lead truck’s human driver has his hands behind his head to show that the trucks are driving themselves. More Self-driving trucks that can travel in automated convoys, like these Mercedes-Benz test vehicles, are one of several market opportunities for Daimler’s driverless technology. Image source: Daimler AG. There are several different groups working on full-blown Level 5 technology. But whenever I talk to experts, their answers are similar to Salesky’s: A Level 4 car that can work in a mapped area in good weather is feasible in the near term, but unless someone makes a big breakthrough, full Level 5 driverless cars are much further way. Two Ford Fusions with visible self-driving sensor hardware are shown testing on a snowy road in Michigan. Winter weather presents big challenges to self-driving systems. Image source: Ford Motor Company. 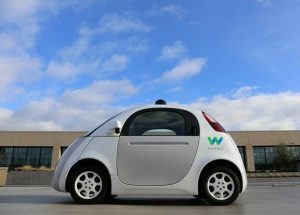 Summing up: How far along are self-driving cars, really? • Late 2018: You may be able to ride in a Level 4 vehicle via a service like Lyft in a major city. • 2021: Vehicles with Level 4 technology might be starting to arrive at dealers for sale to consumers. But at first, it will likely be an expensive option limited to luxury cars. • By 2024 or so: Level 4 will probably be widely available, at least as an option, on many mainstream vehicles. By then, Level 4’s geographical limitations may not be a concern, as the 3D maps will have expanded to cover most of the developed world. But the systems still may not work well in severe weather. • ??? years from now: The first true Level 5 vehicles will start to appear. Long story short: Self-driving cars — in the Level 4 sense — are indeed coming soon. But they’ll be limited for a while yet, and cars that can do anything a human driver can are probably much further away. 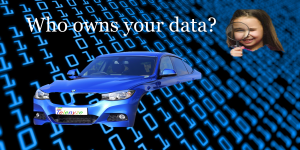 Since embedded telematics is growing on new vehicles, OEMs understand the value of car data and want to build their own cloud platforms to collect and control who gets what data. Currently aftermarket telematics service providers such as Usage Based Insurance and fleet tracking services companies use the OBD II port to access real-time data from vehicles. As reported by the analysts at Ptolemus at the VDA Technical Congress in Berlin, BMW announced the support for German car makers to progressively close the OBD port while the vehicle is being driven. As we learnt from VW scandal a vehicle behavior and emission could be different when parked than when driven. The initial OBD regulation aimed to give access to the engine and emission reduction systems diagnostics data to all third party players for repair and emission check purposes. From the BMW’s announcement, the vehicle would detect that it is being driven and would then stop the OBD data transfer. Independent repairers would still have access to diagnostics data when the vehicle is at the workshop. That way OEMs do not infringe EU competition laws. To be fair, the current OBD norms are not ideal for high-volume data traffic and may cause interference with some vehicle types when in operation. Does it mean the beginning of the end for the OBD-based industry and services such as fleet management, remote diagnostics, insurance, eco-driving, remote lock/unlock of doors, keyless start, to name a few? OEMs have stopped bringing safety issues and potential warranty avoidance as a defense to what they saw was the use of their data in a way disintermediated them. At the same time, the safety and security issue is still real and the move towards proposing a platform that is open, standardized, independent and providing normalized data set should be a welcomed move. Since embedded telematics is growing on new vehicles, OEMs understand the value of car data and need to build a network of value added service provider. They need to compete against the IT giants like Apple, Google or Amazon. At the same time, they cannot monetize the data directly since it doesn’t belong to them. They can however monetize access to their cloud platform and APIs. This is the concept of “Extended Vehicle” that will guarantee access, privacy and interoperability. In the end, the clincher might come from CLEPA, the association of European Automotive Supplier. Particularly through the current development of the CARUSO Dataplace by a consortium of part manufacturers, distributors and repairers. They too aim at creating an open, neutral, interoperable, standardized and secured data cloud and service platform for the whole ecosystem. From a legal standpoint, they might have a better chance than most. The main problem with the Extended Vehicle platform is that it would facilitate an information exchange between independent aftermarket service providers and the OEM. This raises antitrust concerns as competitors should not be automatically informed of each other’s activities. The legal firm Osborne Clarke also confirmed that consumer must have the freedom to choose service providers, service platform, parts and applications being installed in the vehicle. Most importantly, OEMs will be allowed to apply a licensing fee to enable the secured transmission of the data from the vehicle to a platform and make them available to 3rd parties, but the cost will have to be aligned with today’s aftermarket solutions. Passenger vehicles sales in USA is about 17 millions per year today. Global passenger vehicles sales has doubled from 38 millions to 78 millions in last 20 years. EV sales is about 1%. Goldman Sachs predicts electric vehicles will grow from 1 percent of 2016 global auto sales to 8 percent by 2030, before increasing to nearly one-third market share in 2040. The analyst said if governments are more aggressive with incentives or battery technology costs improve, the adoption of electric vehicles may accelerate faster than expected. However, Yuzawa noted, the trend will be negative for many auto parts suppliers because electric vehicles do not have any engine-related components. “Engine and transmission-related parts makers, which generate high value-add as core suppliers for automobiles, are searching for opportunities to advance in electric motor- and battery-related components, but we expect their growth potential to be called into question as EVs become mainstream,” the analyst wrote. On the flip side, battery technology firms will likely thrive. The analyst projects the battery market will grow to $180 billion in sales by 2040 from just $450 million in 2015.